Variable Data or Personalisation is the perfect way to catch the customers attention at first sight. Use it in all kinds of direct mail pieces and benefit from proven double-digit response rates. 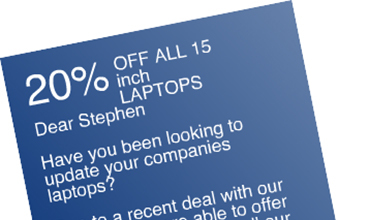 Personalising documents using Variable Data is the ultimate in clever Direct Marketing. Variable Data uses selected text or images to produce individually personalised documents which can be enhanced to create unique messages appropriate to your individual customers. Utilising the latest software and data-driven origination, our digital printing workflow offers the facility to vary each document on the run, allowing for an economical personalisation of printed materials. You can create bespoke marketing campaigns with unique percentage discounts, Christmas calendars with images depicting people’s names on each month, or even reap the benefits of doing away with messy stick on labels.